Finding the right giant chess set for you, based on your location, intended use, budget, and style. Have you ever seen a huge, larger than life chess set in a public park, at a backyard party, or perhaps even at a wedding? If you have, you no doubt remember the feeling of awe and wonder you got the first time that you saw one. There is something so exciting and enticing about oversized chess sets and outdoor chess sets that can’t really be explained, only experienced. Giant chess sets are a lot different from regularly sized sets. While traditional chess sets are seen as a cerebral battleground between two minds dead set against each other, large outdoor chess sets offer a much more communal experience. When someone is playing on a life size chess board, pretty soon everyone wants to come over and get a piece of the action! Giant chess quickly becomes a team sport, with each side of the board calling out their advice for the next move, and everyone wanting to take a turn moving the giant chess pieces. Unsurprisingly, “giant” can mean different things to different people. 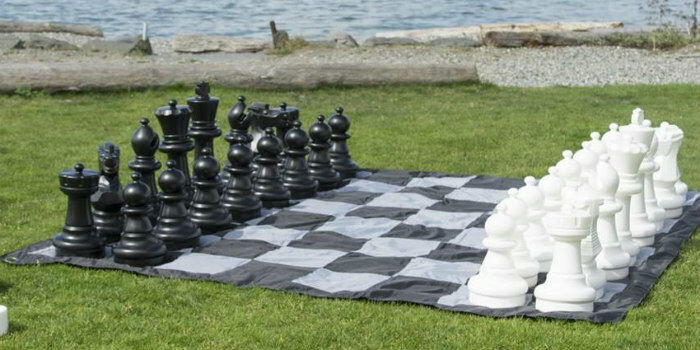 Do you know exactly what size of giant chess set you need? There are many to choose from. How big of a set will fit in your space? These are all things you’ll need to know before choosing a set. How you plan to use your giant chess set will determine its materials just as much as your personal taste and style. There are also some sets that are for indoor use only, so you’ll need to be aware of that if you’re looking for an outdoor chess set. Make sure you know the benefits and drawbacks to each material before you commit! Giant chess pieces come in a variety of different styles and patterns. If you’re looking for a specific style set, it may limit your options in terms of material, size or cost. You’ll need to decide which category is most important to you and compromise on the others! The cost of your giant outdoor chess set will be partially determined by its size and the material, but there is a little bit of wiggle room. Work out your budget and stick to it! Now that we’ve covered the basics, you’re ready to look at a few of the best giant chess sets on the market. After the reviews, we’ll go over what makes them so great in the Buyer’s Guide section and expand on the categories mentioned above. Use Coupon Code ChessSite5 for 5% Off! When it comes to giant chess sets, this is the best that money can buy. It is a completely luxurious product with a beautiful design, effortless functionality, extreme durability, and absolutely no need for any ongoing maintenance. Of course, all of these premium features also come at a premium price, but you’re still getting a huge amount of value for your money. 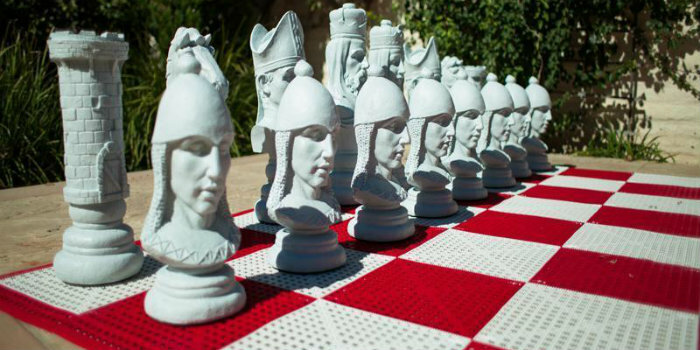 Fiberglass is one of the best materials you can have for your giant chess set. The reasons for this are numerous. First of all, it has a beautiful, shiny finish that plastic sets just can’t come close to. It is also surprisingly lightweight, which makes it easy to move even the largest pieces across the board. 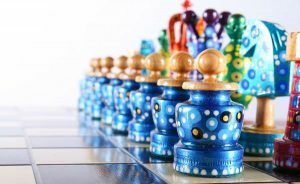 There are many customization options available for Fiberglass Giant Chess Sets because it is easy to achieve vibrant, true colors with this material. Best of all, fiberglass can stand up to anything you can throw at it and still come out looking gorgeous, with normal use. All kinds of weather, sunlight, and years of use won’t cause a bit of use to show on your fiberglass giant chess set! That’s definitely a plus for an outdoor chess set. Still, we wouldn’t recommend dropping or throwing your giant fiberglass chess pieces as the finer details could become damaged with rough treatment. Best of all, they never need to be oiled, stained, sealed, or anything else. A quick rinse with a hose will remove any dirt and have them looking their best in no time. 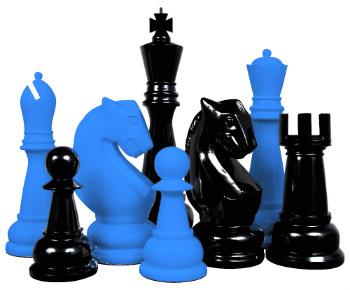 Fiberglass chess sets come in a range of sizes including 24 inches, 36 inches, 48 inches, and 72 inches! For an additional fee, they can even be customized with your choice of colors. With fiberglass, there’s no need to limit yourself to black and white! If you want to stand out even more, there is also a Medieval themed giant fiberglass chess set that is certainly a sight to see. Previously, the design of this set was reserved for exclusively decorative sets, but the strength and durability of fiberglass now make it available for indoor and outdoor use. All fiberglass sets feature free shipping within the US, and international shipping options are available. If you just can’t give up the warmth and beauty of wood, even in an outdoor chess set, the water-resistant Teak Giant Chess Set may be just the thing for you. There is some annual maintenance you’ll need to do to make sure that teak sets retain their natural durability, like resealing them with a special waterproof sealant every year or two, but for the traditional beauty of wooden chessmen on a much grander scale, it’s worth it! 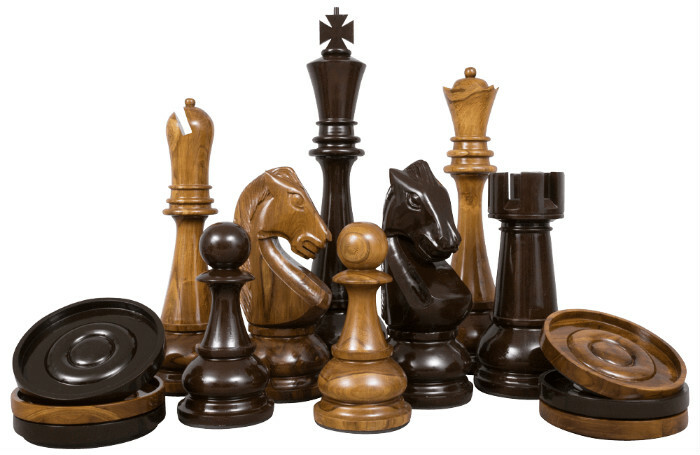 Giant chess sets made from teak are hand carved, making each piece a unique work of art made specifically for you. Because of this, they are available in the widest range of styles of any material, including the traditional Staunton pattern style, the Medieval themed style, and a more modern geometric style. Those three choices offer something for everyone, and you should have no trouble finding a teak set that complements your decor. Teak lawn chess sets are available in the following sizes: 8 inches, 12 inches, 16 inches, 24 inches, 36 inches, 48 inches, and 72 inches. 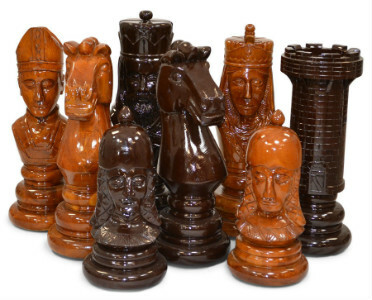 Outdoor chess sets hand carved from teak are beautiful and luxurious with a price tag to match. They are well worth the money if it’s within your budget, though! The teak sets come in the widest range of sizes, including an 8 inch tall set, so you could perhaps compromise and save a little money by getting a slightly smaller set that still packs a big punch! It’s a great way to get yourself a top quality product without breaking the bank. This oversized chess set with LED lights has really burst onto the scene in a big way. It’s a new product, but it’s already become extremely popular and is selling like hot cakes! Part of its huge appeal is no doubt the fact that it’s a great product that’s perfect for anyone’s garden or backyard. 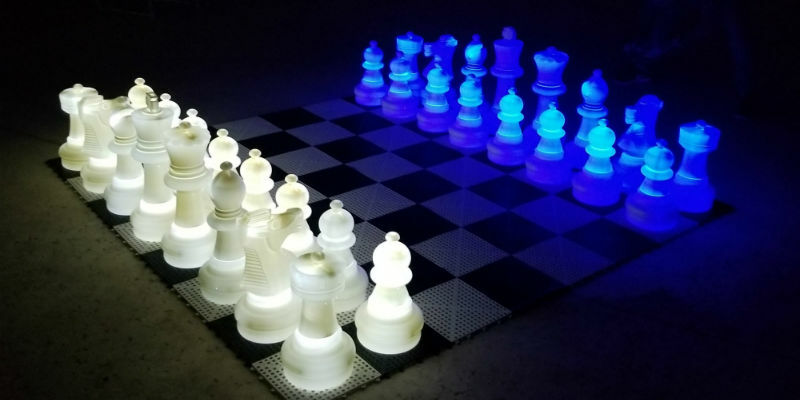 The main thing that makes The MegaChess 25 Inch Plastic Light-up Giant Chess Set so cool and popular is the glowing effect it has thanks to its colored LEDs. They give the chess pieces the effect of being lit from within, which is really cool for a backyard party in the evening. You can even choose from a whole range of different colors! 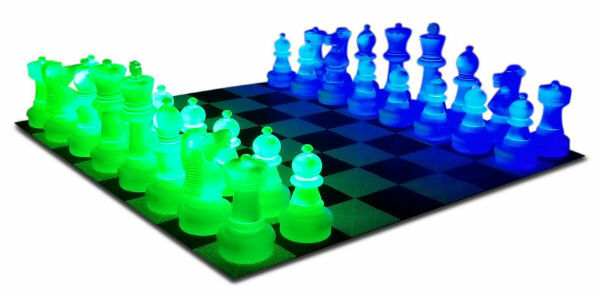 Choose any combination of blue, green, white, red, or on-light up black chess pieces. The black versions are great for playing during the day, since the light up pieces can be hard to tell apart! It costs a bit more, but it’s worth it to be able to use your set any time you want. Despite its overnight popularity, this chess set isn’t for everyone- only people who like really cool outdoor chess sets! But really though, you do need to have an appropriate space to set it up. With large chess pieces ranging between 16 and 25 inches tall, with 9.5 inch bases, this is not a set for the apartment dweller! This large chess set doesn’t include the chess board, so you’ll need to get creative with that part. You could set up paving stones in your backyard, spray paint some squares, or opt to purchase a separate outdoor chess board, whatever best fits your event and budget. 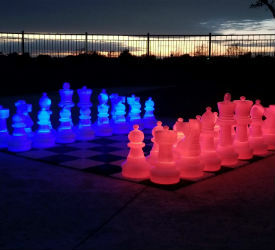 MegaChess Light-up LED Giant Chess Set – Only people who like really cool outdoor chess sets! 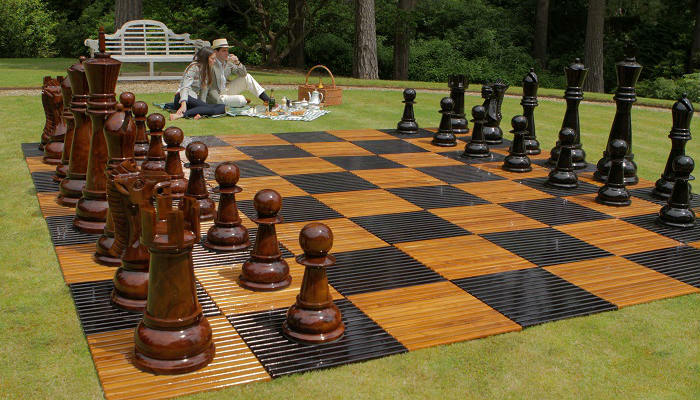 You won’t be disappointed with the durability of this outdoor chess set. It is made from high-density plastic that is nearly indestructible! It can easily stand up to wind, rain, and sun without being damaged. You can rest assured that your investment will keep paying dividends for many years to come. Speaking of your investment- it’s actually surprisingly low. You may think that a giant chess set of this quality would be a lot more expensive than it actually is! 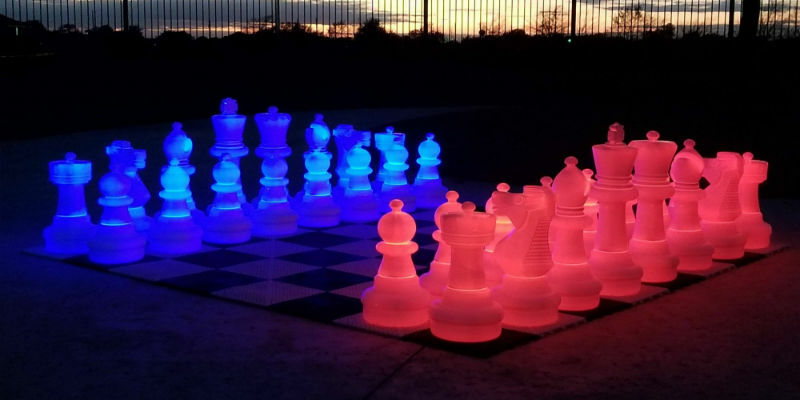 Oh, and our readers can use our exclusive coupon to get an extra 5% discount off the purchase price of the MegaChess 25 Inch Plastic Light-up Giant Chess Set. So what are you waiting for? Plastic chess sets offer the best durability of any giant outdoor chess set. Perfect for families or events with children, large chess pieces made of plastic can really take a beating. You can throw these around, drop them, knock them over, and they won’t even show a scratch. And if one of them does ever become lost or broken, it’s easy and economical to replace it thanks to the extreme affordability of plastic life size chess sets. You’ll never need to worry about bringing your outdoor chess set in out of the weather if you opt for plastic. It’s no wonder that The Plastic Giant Chess Sets are such a popular item among outdoor chess set buyers. They are affordable and easy to care for, and being so durable and maintenance free means that you never have to worry about bringing them in from outside when it rains or snows. The plastic oversized chess sets come in a range of sizes including 8 inches, 16 inches, 25 inches, 37 inches, and 49 inches. There is also a 12 inch extension set that you can use on the 25 inch and 37 inch sets to make them even taller! The heights of the plastic chess sets are more customizable for the plastic sets than the other materials because the plastic giant chess sets are available with additional plastic extensions that you can put on or take off to adjust the height of your large chess pieces. This means that you never need to worry about having one size set for adult events and a shorter size set or kid’s events – you can just modify the one set to fit a range of different scenarios! That’s flexibility that saves you money, since the full set of extensions costs substantially less than an entirely new giant chess set would. When it comes to color customization of your plastic giant chess set, your options are somewhat limited. Because of the stain resistant properties that make this plastic so impervious to dirt and grass stains, paint doesn’t adhere well to its surface. Right now, there are only two colorways available – traditional black and white or red and white. However, you do still have some options for customization. For a small additional fee, you can have your logo or message laser engraved on all of your oversized chess pieces. This is a great option for weddings or corporate events where you want your brand to be recognized. 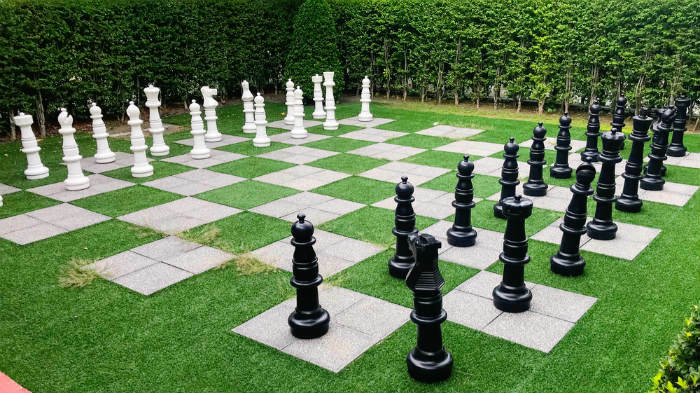 One of the best selling giant outdoor chess sets on the market, this outdoor chess set from Chess House is another great addition to any backyard. The bestselling version is the 25” giant set, although a 16” version and a 12” version are also available. The smaller sets would be best for people who want to use the large chess set both indoors and outdoors, or for small children, but for most applications we recommend the full size 25” version. Bigger is definitely better when it comes to giant chess! 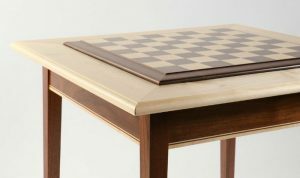 The ChessHouse large chess set comes with your choice of either a nylon or plastic mat that serves as the chessboard and playing surface during the game. We highly recommend going with the plastic version, since it is much more durable than its nylon counterpart. The plastic mat consists of a series of interlocking black and white squares, whereas the nylon version is just a simple patterned cloth that you lay on the ground. So, the plastic version does take a little bit longer to set up, but it also provides a much better gameplay experience and looks way more impressive! The plastic mat is a bit more expensive upfront than the nylon mat, so if you’re on a tight budget, you may be tempted to just get the cheaper one, but since the plastic version is so much more durable, you may end up replacing the nylon mat several times before the plastic one would need to be replaced. The hassle and expense of replacement quickly eats up and savings you had in the beginning. Speaking of replacements, when you buy The ChessHouse Giant Chess Set you can opt in to a 3 year part replacement plan which will cover you if any of your giant chess pieces become lost or damaged. 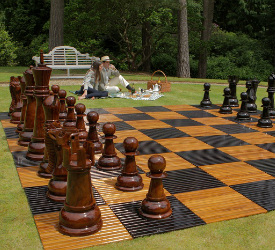 We highly recommend it and see it as a must for this type of outdoor chess set. You’d be surprised how easily these giant chess pieces can catch a breeze and be blown away if you forget to fill them with water or sand to add extra weight. Both your initial purchase and any replacement parts you need will be eligible for free shipping anywhere in the US. So now that you’ve seen a couple of great options, let’s go over the factors that make them so great. As we mentioned briefly before, there’s a lot that goes into choosing the perfect lawn chess set for you – you have to consider many things such as size, material, style, price, and more. The ideal size of your giant chess set will be determined both by the amount of space that you have to work with in the area where you want to place the set, and the size of the people who will be using it most of the time. 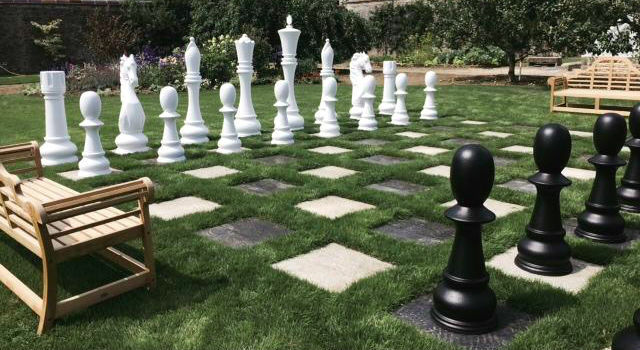 Obviously, a garden chess set that seems huge to a child isn’t going to be that impressive to an adult, and likewise, a good sized outdoor chess set for an adult would be difficult for a child to even move, let alone play a game of chess with. 8 inch and 12 inch sets are best for very young children. They can easily move the pieces around without being towered over by life-size Knights and Rooks, so you won’t have to worry about pieces falling over on them. That’s not to say adults can’t use them too – a nice 8 inch set can be the perfect thing for a large chess table, whether you actually play with it or just keep it as a decorative display. A 16 inch set could be good for slightly older children, or buyers with tight space or budgetary constraints. 25 inch sets are a great choice for residential use, and they’re also favored by elementary schools. 37 inch sets seem to hit the sweet spot of impact and economy for most people, since they’re one of the biggest sellers. The yard chess sets that you see on cruise ships, at hotels, in parks, on college campuses, and elsewhere are most likely 37 inch sets. Taller sets, like 48 inch, 49 inch, and 72 inch sets, are for people who want the maximum possible impact and don’t mind the increased cost. At 6 feet tall, the 72 inch sets are taller than many people and may be difficult to actually play with, so they’re best used as a decorative piece. 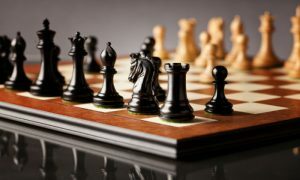 Though not as numerous as the range of available materials of regular size chess sets, you still have many choices when it comes to the material of your life size chess set as well. Each one comes with its own pluses and minuses. 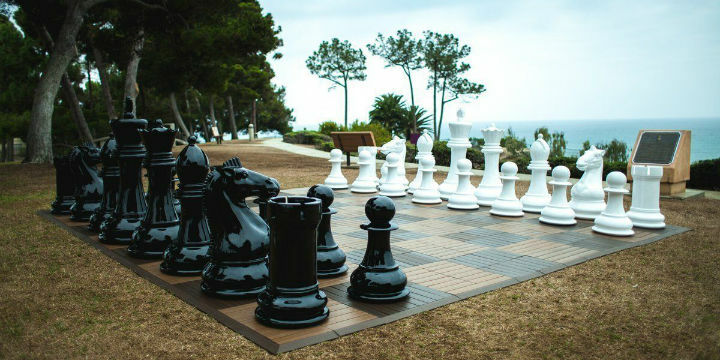 The typical materials you’ll see giant outdoor chess sets available in are plastic, teak wood, rubber tree wood, and fiberglass. Plastic is the most economical option of all. 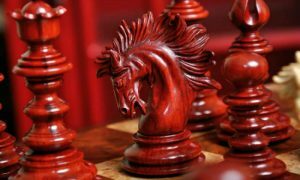 If you’re on a strict budget and don’t want to sacrifice the size of your giant chess pieces, plastic could be the best material for you. It is also extremely durable, so it’s the best choice for sets that will be used by children or even drunk adults who may be a little less than gentle with them. Outdoor chess sets made from plastic are virtually indestructible. They can be dropped, thrown, knocked over, left in the sun for years, and subjected to all sorts of weather without showing a scratch. Plastic pieces are a great choice for people who want the functionality and durability of a reliable big chess set that will last and don’t care too much about looks. Hand carved teak wood pieces are a gorgeous addition to any lawn. It’s also a versatile choice because it comes in many different styles to suit any taste. 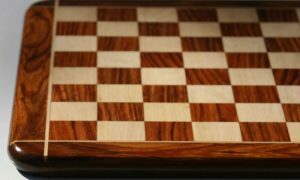 However, the downsides are the increased cost as well as the yearly maintenance that’s required to keep teak wood chess sets looking their best. Fiberglass offers all of the beauty of teak wood along with the maintenance free ease of plastic. Needless to say, all of this comes at a price, and fiberglass big chess sets are among the most expensive. Still, many people find the cost justified because of the increased range of custom colors that are available with fiberglass giant chess sets. The material allows for more fine detail to show through on the pieces, but it’s not quite as durable as plastic – misuse or rough handling could damage these pieces. The styles that are available for your garden chess set depend largely on which material you choose, and the style you pick will also affect the final price. For example, large fiberglass chess sets are easily customizable with any set of colors you choose, but they do cost a premium. Teak sets are available in the Staunton pattern, a Medieval style, and a modern geometric style, but they’re also not cheap. The plastic sets have the least variation in available styles and colors, but they’re also the most cost-effective. You’ll have to decide how important having a certain style is to you. Is it worth going over budget? Price will of course be affected by the size, material, and style that you choose, but there are ways you can keep your costs down. For example, plastic sets can stand up to almost any type of use, location, or weather conditions, so they’re always an option if you need to save a little money. You could also spring for a premium material, but opt for a smaller size to save a little bit. Finally, you could go for the size and material of your preference, but opt for a simpler style to keep costs lower. Or, you could get exactly what you want and go over budget a bit investing in a high-quality giant chess set that will last for years. It’s all about your priorities! Some giant chess sets come with a giant chess board already included, but if yours doesn’t, you’ll want to have a plan for how to handle that. There are large chess boards that you can buy, made from either vinyl or plastic, or you may choose to DIY outdoor chess board. Whatever you do, make sure that the squares of your board are large enough to accommodate your pieces! The minimum you should plan for is a 12 inch square, though some of the larger sets require an 18 inch square or more. This information should be listed in the product description of the set you’re interested in, so find out for sure before you buy or start building your giant chess board. Now you know all you need to know to be able to confidently buy an outdoor chess set that works for your space, your users, and your wallet. All that’s left to do is go any buy the perfect set! If you’re not quite ready to buy yet, you do also have the option of Renting a Giant Chess Set. 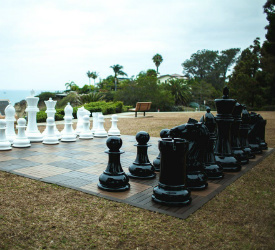 A giant chess set rental is a great way to secure an outdoor chess set for a party or other event without having to buy one for yourself, or even to test drive a certain size or material before deciding whether you want to buy it or not. 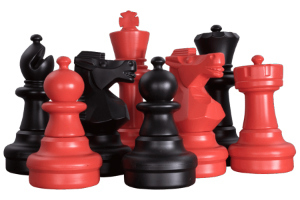 Chess Sets: Our List of the Best Chess Sets on the Market. 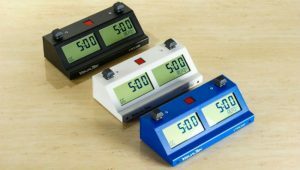 What about GIANT TIMERS ? It seems like someone thought of the Clock Timers in just as an impressive size!